Custom Printed Doorknob Hanging Bags – Perfect for Hotels and Door-to-Door Literature Distribution! These Custom Printed Doorknob Bags are available in six sizes, ranging from 6" x 16" to 11" x 18". The Custom Doorknob Bags feature single wall, 2mm thick plastic and a 2" die cut hole. Single or double side imprinting of your design is available. Printed Doorknob Bags are great for hotels and door-to-door sample distribution. You can choose from either white Bags or Clear Doorknob Bags (3,000 piece minimum for clear bags). Your logo and message can be imprinted in one- to full-color. 6X16DW-1 6"x 16" Doorknob Bag 0.29 0.24 0.20 0.18 4½" 12"
7X12DW-1 7½"x 12" Doorknob Bag 0.29 0.24 0.20 0.18 7½" 12"
7X18DW-1 7½" x 18" Doorknob Bag 0.33 0.28 0.24 0.20 6" 14"
9X13DW-1 9"x 13" Doorknob Bag 0.31 0.26 0.23 0.19 7½" 9"
9X15DW-1 9"x 15" Doorknob Bag 0.33 0.27 0.24 0.20 7½" 11"
11X18DW-1 11"x 18" Doorknob Bags 0.44 0.35 0.29 0.27 9½" 14"
It's easy to get started with your Custom Doorknob Bags. Simply contact us at 1-800-233-0828 and submit your camera-ready artwork to graphics@kardwell.com (you can also mail your art). You will receive your Printed Doorknob Bags in about 3 weeks. Rush delivery is available. 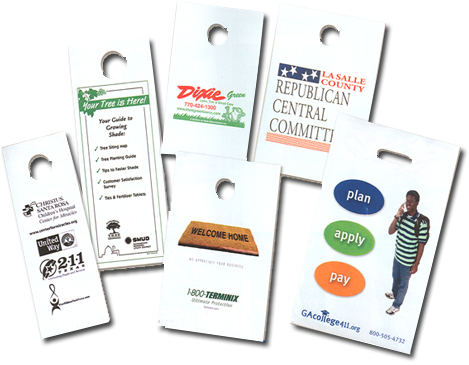 For more information on our Custom Printed Plastic Doorknob Bags, please contact us at 1-800-233-0828.